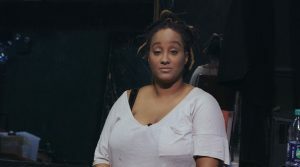 Just before the start of the 2019 SXSW Film Festival, I interviewed director Rodney Evans to discuss his new documentary Vision Portraits (which I also reviewed), which profiles four artists – including Evans, himself – who are all, to varying degrees, either blind or going so. Through beautifully evocative on-screen visuals and interstitial textual meditations on sight and the loss of it, the film introduces us to photographer John Dugdale, dancer Kayla Hamilton and writer Ryan Knighton, all woven into the uber-narrative of Evans’ own story. An inspiring account of personal strength and creative vision (who needs eyes to see? ), Vision Portraits reminds us that sensory perception takes many forms. Here is a condensed digest of our conversation, edited for length and clarity. Hammer to Nail: When were you first diagnosed with retinitis pigmentosa? Rodney Evans: I was first diagnosed in late 1996/early 1997. It’s a little bit hard to…well, I think the symptoms, obviously, were prevalent before the diagnosis, so I started feeling the symptoms in late 1996, but I don’t believe I was diagnosed until 1997. HtN: That’s actually further back than I thought. In the footage where we see you accepting your award at Sundance in 2004, then, you were already experiencing symptoms. RE: Yeah, yeah, for sure. I had already had to figure out ways of accommodating and letting my crew and cast know about the issue. You know, sets are places that are fraught with potential danger, so if you have limited vision and could knock over a really expensive camera, you might want to let someone know. HtN: Sure. It’s not just a temper tantrum. You’re not pulling a John McEnroe and knocking things over. RE: (laughs) No, I’m not just smashing that 5K light that you put up next to me. HtN: Even though you describe in detail what you can and cannot see, at least in the present, in Vision Portraits, has anything changed since its completion? Has your sight improved or changed since the procedure we watch at the end of your film? RE: It’s similar to what I say in the film in that I haven’t really experienced significant changes in my daily life, but through the testing and through just the measuring of the signal from my optic nerve to my brain, they can see that the signal is a lot stronger and they can see that my peripheral vision has gotten wider. I am able to take in more of the periphery, just through these field-of-vision tests that they do every few months. They were able to see positive changes from the tests that you see in the film. HtN: Excellent, because indeed, that procedure was supposed to improve your peripheral vision. RE: Yeah, and it did, just not in a huge way where I’m able to put my cane away in Penn Station and walk around freely and not be concerned about bumping into people. (laughs) You know, that’s definitely not happening. Penn Station is still very filled with obstacles that I need a cane to help navigate. HtN: Understood. How did you find your three other subjects: John Dugdale, Kayla Hamilton, and Ryan Knighton. I know you made a 2016 short about John, entitled Persistence of Vision. RE: Yes. The short was always intended as material for the feature, and what ended up happening is that because I teach at Swarthmore College in the Film and Media Studies Department during the year, I would spend most of my summers at artist residencies just working on each character’s chapter, and so I edited John’s chapter first in the summer of 2015 at a residency in upstate New York at this place called Yaddo, and I just really liked the way that it came out and I liked the way that it stood on its own. I just decided to start sending it out and see what happened, and so I sent it to BAMcinemaFest, and luckily, they really liked it and decided to show it in 2016. It played at a few festivals like Frameline, the LGBTQ festival in San Francisco. John and I met through a friend of my brother’s who dated John for about 10 years. You know, I have to say that John is not really one to court publicity. He’s very reticent about who he speaks with, and because I knew someone who was really close to him, I was able to set up a lunch date with John and talk to him about the project. I then subsequently went over to his place and showed him some of my short documentary films where I actually make myself vulnerable. I think, for whatever reason, that made him more susceptible to wanting to be a part of the project, the fact that I was able to share my own experiences in a vulnerable way in front of the camera. HtN: So, is the short film Persistence of Vision exactly the chapter on John that appears in this new film, or is it a shorter version of it? RE: It’s actually been significantly reworked. I mean, it’s not hugely different. I think the major differences are that throughout the course of making the film I became more of a character within the feature, and within the short film I am not a character at all. It’s really focused on John. You don’t hear me asking John questions, there isn’t the segment where he makes me close my eyes and repeats a litany of different objects and asks me if I had any trouble seeing those in my imagination. Those sections were added later when I became more of a character in the feature. HtN: Right, and by the way, I really like that section where you close your eyes. It’s a nice evocation – one of the many nice evocations in the film – of blindness or limited sight. So, how about Kayla and Ryan? 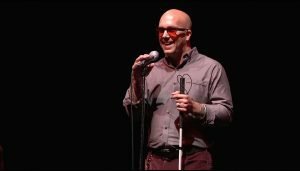 RE: Ryan Knighton wrote a really brilliant memoir called Cockeyed that basically documented his evolution as he was diagnosed with retinitis pigmentosa at 18 and slowly lost, I would say, 98% of his vision over the course of about seven to eight years. It’s a memoir, so it really chronicles a lot of the symptoms that he was seeing, a lot of the episodes that were happening when he was working in warehouses, operating forklifts and not knowing that he had very limited peripheral vision. I really related to his book and he had already created a screenplay version of the memoir that was accepted into the Sundance Screenwriting Lab, and I had also submitted my screenplay, which made it to the second round but didn’t make it to the finals, and then I just asked Michelle Satter, who runs the Sundance Labs, if there was a director involved in the project and she said no and was nice enough to put me in touch with Ryan. We met when he came to New York in 2008 and have just been friends ever since and stayed in touch. Kayla, I did not know, but we have a mutual friend who was a dancer and I was talking to him a little bit about the project, and frankly, I wanted a dancer with limited vision to be in the project and I also wanted a woman to be in the project. He specifically thought of Kayla and put me in touch with her, and then we had breakfast and it just so happened that she had been working on this solo project, which was a dance project, for three years and was about to premiere it the following weekend in the Bronx. As soon as we met and got along and she agreed to be in the project, I started filming her in rehearsal and filmed the opening weekend of that performance, which was called Nearly Sighted. HtN: Right, that’s the one where the audience members all wear an eye patch on one side. HtN: Speaking of you filming, we see you behind the camera quite a bit in this film, though your official cinematographers are listed as Kjerstin Rossi and Mark Tumas. How much of the film would you say that you, yourself, shot? RE: It’s a little hard to quantify, but I would say I probably shot 25 to 30% of it. But I was always kind of running the B-camera and either Mark or Kjerstin were shooting with the A-camera, and they were both Canon C100s, so we made sure to calibrate them so that they had a similar look. Obviously, if I’m a character in the shot, then it’s someone else. HtN: Got it. So, I loved your on-screen evocation of different forms of limited sight, as I just mentioned, whether through blurriness, abstraction, the combination of both, or even your use of experimental film clips as a sort of B-roll. Could you talk about your process of creating and gathering that material? RE: Sure. Some of that is film footage from previous films that I’ve shot. I feel like we used my body of work as my own personal archive. For example, when John talks about his vision being similar to the aurora borealis and you suddenly see really grainy, colorful abstract 16mm footage, that is from a Super 8 rolling-out that I shot for a documentary called Close to Home in 1998. I had just had that film digitally remastered. That footage is slowed down and just combined with other material that we shot for this film to kind of evoke the aurora borealis. That would be one example. Then, I think a lot of it was [editor] Hannah Buck’s brilliant graphic capacities and talents in the edit room. She would layer images on top of each other and color things in a specific way and build mattes so that they could evoke the subjective vision of the characters in the film. She does that with Kayla at the start of her chapter, where there’s an abstract close-up of an eye that starts very abstract and then gets more literal as the shot progresses, and we shot things like letters floating in bodies of water, and then Hannah reversed those things and played with the color palette and layered those on top of Kayla’s eye footage. You know, it just creates a more abstract world that evokes the subjective vision of the specific characters. HtN: It works really well, as does your on-screen use of text, which I found really powerful. Speaking of text, I also really like how you formatted the movie’s title card as an eye chart. RE: Yeah, that was something the title designer came up with. HtN: It was very clever. So, about your use of text, how did you decide what should be written on the screen? Because so much of your film, in a movie about limited sight, is visual. RE: Well, the film really took about four years to create, and so as I was doing a lot of the research, the ways in which I was reacting to the research … and the research consisted of case studies of blind musicians throughout the 20th century, to reading specific books by blind authors writing about their experience, to the disability-studies reader where there are a lot of texts about people within the performance world working with disabilities…the ways that I was reacting to a lot of the research was through these poems. I wrote one, and it’s the first one that appears in the film. I just tried it as an idea, and I wasn’t necessarily attached to it. I thought I was going to probably cut it out, but I showed it to Kjerstin Rossi, who’s one of the main cinematographers, and she was also at this residency where I was working on John’s chapter, because she’s a filmmaker/director in her own right. We had just become friends and I showed her that section, and she was like, “Oh, no, I love that poem, you can’t leave that out.” Because that was what started John’s short film. I showed it to another editor friend who I work with on my fiction films, and she really loved that as well. So, I just continued writing those short poems and I included them in the rough cut, and Hannah and I kind of finessed them in terms of how long they should be and where they should be placed. It was really part of the structuring of the film. Those were sort of written in reaction to a lot of the research that I was doing, which was a very new form for me to be working in. HtN: Well, they work wonderfully in conjunction with everything else. HtN: I really want to thank you for making the film, as it’s really quite beautiful. I wish you all good things with it at SXSW and beyond. RE: Thank you. I appreciate you taking the time to talk.